The Future is Bright. The Future is 2D. [Voice of Majel Barrett-Roddenberry] Previously on neiloseman.com: I hate 3D. And now the conclusion: So does everyone else. I was delighted this week to read a very interesting article about 3D on Shadowlocked.com It’s a very well-reasoned argument against the proliferation of 3D cinema, so no regular readers will be surprised that it struck a chord with me. 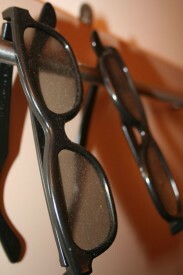 What particularly grabbed me was the news that audience figures are declining for 3D screenings. To give just one example, 2010’s Shrek Forever After made 60% of its opening weekend box office from 3D screens, whereas this year’s Kung Fu Panda 2 made only 45%. Anecdotal evidence seems to suggest that the headaches, uncomfortable glasses and dimmer projection are putting people off. Many people around the globe are working hard to design and implement improved 3D projection that eliminates these problems, but now it seems there is a real chance the 3D bubble may burst before they succeed. After Cannes this year I was certain that the bell had tolled for 2D films (I’ll keep using the term for clarity, despite Nolan’s excellent point above) but now it seems the tide might be turning – something I hadn’t dared to hope for. Perhaps 2D might just win this war after all. DEATH TO 3D! DEATH TO 3D! DEATH TO 3D! Oh, and joy to the world and merry Christmas and stuff. Here’s the latest podcast. Only six days left now to sponsor Stop/Eject if you want to claim access to the exclusive new documentary about the financials ins and outs of Soul Searcher. Need some cinematic inspiration and advice to get your 2012 filmmaking plans off to a flying start? As a special Christmas gift to Stop/Eject supporters, anyone who sponsors the film (any amount) by midnight on Christmas Eve will get access to an exclusive new featurette I’m currently creating: “How to Make a Fantasy Action Movie for £28,000”. This will be a detailed look at the budget from my feature film Soul Searcher, analysing where all the money came from and exactly how it was spent, examining the contracts given to the investors, comparing the distribution deals I was offered and revealing precisely how much money the film made. This is an unprecedented real-world case study of the financial realities of indie filmmaking. Get it in YOUR inbox on New Year’s Day by sponsoring Stop/Eject before Christmas. You’ll also get all the great rewards we’ve been offering all along. And don’t worry – if you’ve already sponsored Stop/Eject, you’ll get access to this video too. Remember to keep spreading the word about Stop/Eject, just like Hereford Journal (left) and Sci-Fi London have done this week – thanks guys! Here’s a brand new Stop/Eject podcast in which Katie takes us through some of the costumes and bags she has already put together for the main characters. Looking for a unique Christmas gift for a film-loving friend or relative? Why not sponsor Stop/Eject on their behalf? They’ll get their name in the credits and receive exclusive souvenirs like signed DVDs and artwork. The sequence was filmed in the Hamptons, a popular holiday destination at the east end of Long Island, near New York City. 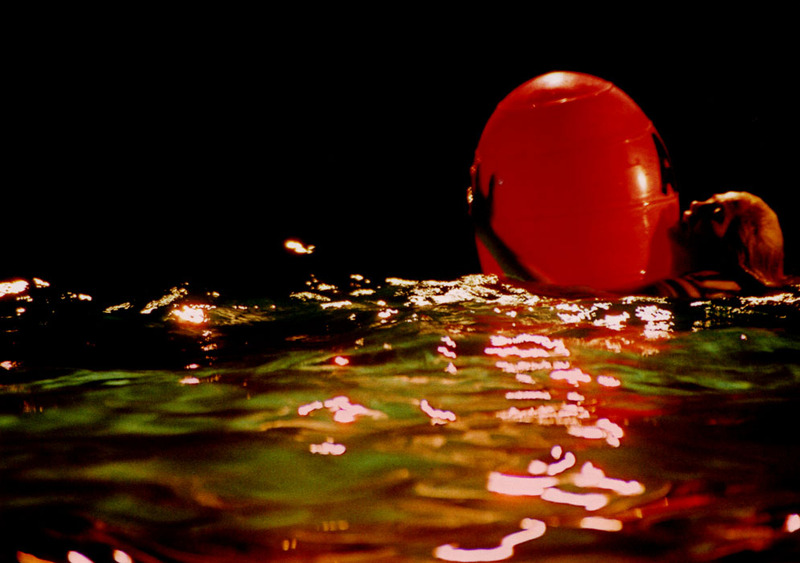 The boat was filmed in a harbour, with the camera and an HMI lamp on the dock. I wish we could have put either the camera or the HMI in another boat, because it’s never a good idea to have your camera and your only light source close together; you end up with flat lighting that looks like flash from a stills camera. Unfortunately we didn’t have much choice. Putting the HMI on a boat was too dangerous, and putting the camera on a boat would have rendered the footage too shaky for successful compositing with the other element of the sequence: Katherine. 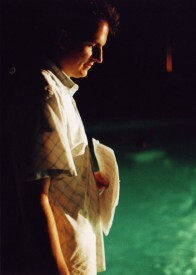 Katherine, played by producer Aimee Denaro, was filmed in an outdoor swimming pool – again, of course, at night. We had been able to get hold of a single black drape, which we rigged half in and half out of the water, to hide the stand for the backlight and to cover the blue-painted pool interior. We originally planned to frame all our shots tightly enough that this drape would fill the entire background, but we ended up shooting off it quite a lot. Fortunately the surroundings were dark enough that we got away with it. Aside from the backlight there was one other lamp – a key light coming in from the side. Both were 800W tungsten pars if memory serves. As I often do on night sequences, I white-balanced on a red-gelled lamp, fooling the camera into turning everything blue for that classic James Cameron/Michael Mann look. After shooting all the set-ups from the poolside, it was time to dive in – quite literally – and shoot the underwater material. That’s when the fun began. We had spent the last couple of weeks trying to find an underwater housing we could hire, but nowhere had one that would fit our camera (a JVC GY-HD110). In the end we had to settle for a splash bag designed for ENG (i.e. proper broadcast) cameras. A splash bag is simply a rubber bag with a waterproof zip and a porthole of optical glass at one end. They’re not designed to be used at any depth, but will keep the water out down to a metre or two. So far, so good – this restriction fitted in with Tom’s shot requirements just fine. But because our camera was too small, we could not screw the filter thread into the porthole inside the bag. This meant there was no way of keeping the camera in a fixed position within the bag. This was, not to beat about the bush, annoying. Oh, and did I mention that the battery adapter on the camera had a loose connection which caused the camera to shut itself off sometimes? Anyone who knows me knows that I am very quiet. I doubt most of the cast and crew were accustomed to hearing me say much of anything. They were certainly all pretty shocked when, within a few minutes of starting to work with the splash bag, I was cursing and swearing like a trooper. The difficulties of trying to swim, keep the bag underwater (it had plenty of empty space in it so it wanted to float), keep the camera lens lined up with the porthole, prevent the focus ring from rubbing against the inside of the bag and throwing the image out of focus, all at the same time, almost drove me insane. Add to that the battery coming loose from time to time and you can see how I might have been a tad frustrated. But after a while I learnt to contort my body and the bag into a stable configuration and we got some great shots. By the time we wrapped, thanks to the pool’s automatic overnight chlorination system, we all had red, stinging eyes and Aimee’s top had been completely bleached. The next time I shot underwater – which I may blog about in the future – rather than trying to hire a housing to fit our camera, we hired a housing that came with its own camera. In hindsight I wish we’d done this on See Saw. If you’re going to try it yourself, I’d recommend getting hold of some diving weights because you’re always fighting the natural buoyancy of the housing. Remember that tiled walls and painted lane divisions are dead giveaways that you shot in a swimming pool; don’t rely on the distorting effect of water to hide these – it doesn’t work that way. Bring drapes or tarpaulins to fill your background. Okay, that’s all for now folks, but if you enjoy reading this blog then please consider contributing a little cash towards my new short film Stop/Eject. What would a six week shooting schedule for a micro-budget fantasy-action film look like? Possibly a lot like this. Watch Going to Hell: The Making of Soul Searcher to get the full story, or find out more about how the schedule was constructed in the featurette below. Everyone says crowd-funding takes up a lot of your time, and it’s true. This week I’ve set up an iTunes podcast, started a Facebook page, uploaded desktop wallpapers (in widescreen and 4:3 ratios), authored DVDs of the pitch video and am attending three events to network and spread the word. 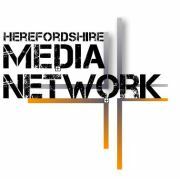 The first event was a Herefordshire Media Network social. This was held in the back bar of a pub and involved myself and two other people giving little presentations and then general mingling/networking. As usual at these events there were a surprising number of people I didn’t know. Hereford is so small that I tend to assume that I must know everyone here who works in the media, but more people always seem to crop up. The other speakers were Marc de Jersey, filmmaker and international broadcast journalist, and Nick Fogg, a filmmaker whose 90 second documentary Wake recently won the main award at Encounters International Film Festival. Both showed some of their work, which was really interesting in very different ways. I felt pretty shameless plugging my crowd-funding campaign, which – let’s face it – is essentially begging, but people responded well. After the presentations I talked to as many people as I could and handed out plenty of business cards. The second event was The Neighbourhood Watch at Vivid in Birmingham. It’s been a very long time since I was last at Vivid, but I thought it would be worthwhile showing my face and trying to make some regional contacts. The event was an “open mic” film night, meaning that anyone could submit a film to be screened and none would be rejected, time permitting. 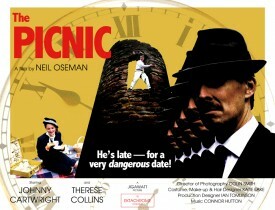 I screened The Picnic, to the end of which I had added a caption telling everyone to visit my Crowdfunder page and sponsor Stop/Eject. I also mentioned the campaign when I introduced the film. Sadly there wasn’t much opportunity for networking, particularly since I had to leave early to get the last train back, but it did get my mind whirring on the possibilities of holding talks and screenings and using them to raise funds… of which more another time. The third event, happening tonight, is a local meeting about community TV, which apparently is something the government is pushing at the moment. I don’t know much about it, but I’m going along to see what opportunities there may be to get involved – and don’t think I won’t plug my crowd-funding campaign while I’m there. Thanks again to everyone who’s contributed so far, and to everyone who has helped spread the word by email, Facebook, Twitter and – shock! horror! – physical face-to-face communication with mouths and ears and vibrating air molecules.